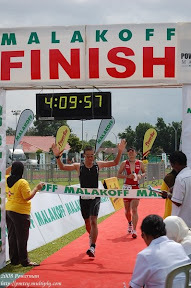 It happened few weeks ago, the 2nd RBAF triathlon. Instead on Sunday, they did it on Friday morning. In the individual public categories, from the list, there were 16 registered triathlete but those who really come, were less than that. Hj Ali Sofian and me were the only participants from last year triathlon. Ahmad Fathi and Hamsul cancel their participation due to unavoidable circumstances. I arrived a bit early on Friday morning and managed to get a good parking near the entrance, so I don’t have to walk that far. I thought the swim was going to start at 6am but it was at 6:20am. 6am was still a bit dark, thus navigation would be a bit difficult. This year, it was a mass start where everyone start at the same time – Individual and team swimmers. The individual categories were asked to be in front. What a mistake it was, All those top swimmers from the team categories rush to the front at the start of the horn. As a result, I’ve also followed them, not knowing that eventually I was out of breath and trying to breath in and out of the water. I managed to swim to a nearby pole, grab on it and luckily there was a small platform underneath it, so I stand on it for about 10 to 15 seconds just to lower down my heartbeat. First time ‘nafas ku hancur masa swimming’ have to remember that next time. Managed to finished the swim around 40 minutes. Very much slower than my swim trial which was 33 minutes. My last year swim time was 37 minutes. Arriving at T1, checking the bike rack, I can only see a few bicycles left in our group. That is totally not good. I was 9th or 8th position. Managed to clock 1:07:48 which was faster than my last year bike time. I’ve managed to ‘sayur’ more than 10 cyclists especially from the team categories. From my group, if I’m not mistaken, I’ve managed to overtake 3 cyclists. And the good thing was nobody overtake me. YESSSsssss. The 10km run. I know from the start, my run will be slow. Didn’t really trained for it. I got ‘sayur’ed’ by most faster runners but luckily none from my group. My time was 1:01:39. Last year it was 57 minutes. After crossing the finishing line, I tried to get my ranking but I can’t find the exact position. I believe my position was 6th based on my counting. Unexpected, I got 5th place. I was very surprised and happy. I counted wrong. Last year 2nd place winner, this year 5th place winner. B$100 richer. Next year, must get better ranking than this or I should try team event – Team Anakpanyu with me as the swimmer, Ali as the cyclist and Zaeidi as the runner. Do we have the chance to win? 1st to 3rd place maybe not, but 4th and 5th place, most probably, maybe lah. Keep on training…………………Train HARD, win EASY – The Kenyan way.